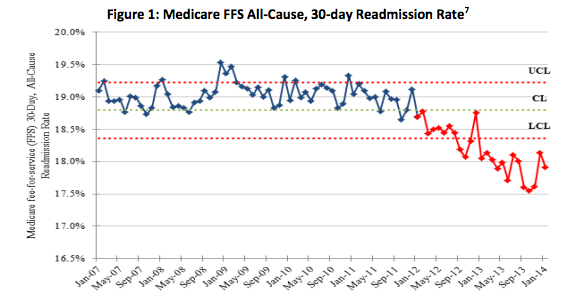 Hospital readmissions are down, but are they appropriately measured? The data in this report shows a substantial nine percent decrease in harms experienced by patients in hospitals in 2012 compared to the 2010 baseline, and an eight percent decrease in Medicare Fee-for-Service (FFS) 30-day readmissions. National reductions in adverse drug events, falls, infections and other forms of harm are estimated to have prevented nearly 15,000 deaths in hospitals, and saved $4.1 billion in costs, and prevented 560,000 patient harms in 2011 and 2012. You can read more about this by Jordan Rau. Among the remaining issues pertaining to hospital readmissions are the extent to which they should be adjusted for sociodemographic factors. The National Quality Forum recently wrestled with this. New research by two sets of investigators and published in Health Affairs adds to the debate. Some key passages follow. These findings have led to some controversy and a great deal of public debate on whether the readmissions measures used by CMS to penalize hospitals should control for socioeconomic factors. On one side of the debate are supporters of the existing policy to exclude socioeconomic factors from risk-adjustment models in order to maintain the visibility of differences in health outcomes for groups with different socioeconomic characteristics. The opposing argument supports controlling for socioeconomic factors to avoid disproportionately penalizing hospitals that care for a large number of patients from disadvantaged backgrounds and communities. 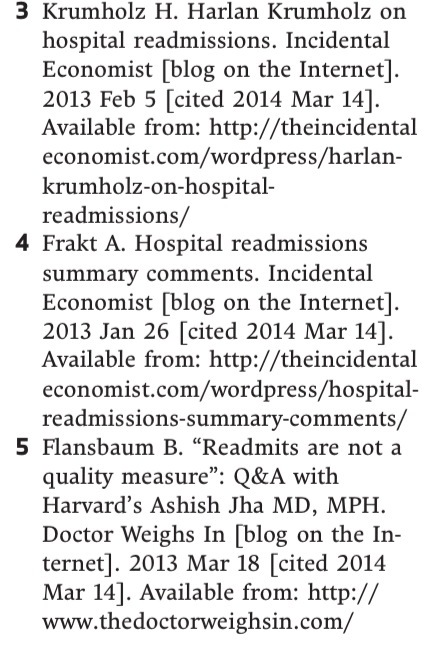 The question underlying the debate is centered on whether the quality of care received in the hospital can influence the portion of the patient’s risk of readmission that is attributable to his or her socioeconomic circumstances. However, some stakeholder groups and scholars have expressed concern that the current CMS policy would disproportionately affect hospitals that provide care to patients of low socioeconomic status. They argue that the policy assumes that readmissions are a result of poor quality care, but instead readmissions are driven largely by patients’ circumstances after discharge, such as lack of social support at home or in the community, and are therefore outside the control of hospitals. * Caution is warranted. Just because a few indicators look better doesn’t mean care is better overall. ** Words deliberately chosen to reflect an actual or appearance of bias.